Without fail, anytime I settle down to work on a programming project, a large chunk of my time is devoted to searching Google and StackOverflow for the best ways to tackle a given coding issue. Even if I haven’t run into a problem per se, looking for the most efficient approach to a function or finding a snippet of code that carries out a specific purpose are just a couple reasons why I’m continuously researching whatever language with which I’m working. That’s why Quiver is such a huge help to me. 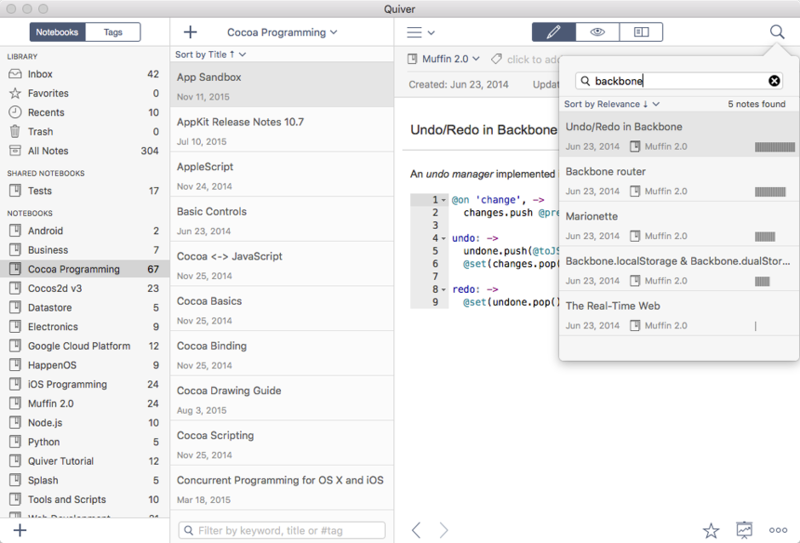 At its most basic level, Quiver is a note-taking app specifically designed to handle notes that contain code and explanations of said code. Notes are comprised of cells, with each cell being capable of handling text, code, Markdown, LaTeX, or diagrams, and a user can create as many cells as desired in a given note, and with these cells one can mix text and code into an easily readable format that works very well for integrating lines of code and explanations of their usage. Notes can be categorized into notebooks, and in my own collection of notes I have a notebook for each programming language in which my notes are written. I also try to use descriptive titles when naming notes so looking for a specific project years down the road will be much easier. Tags can also be added to notes which further help to categorize them based on programming language, technique, or other groups of your choice. Search works very well in Quiver, with near-instant searching of all titles, tags, and text being powered by Search Kit, the same engine running OS X’s Spotlight search. Quiver contains two search bars: one in the top right to search all notes, and another at the bottom of the notebook view for only searching notes and tags in the selected notebook. A feature that truly makes Quiver great is inter-note linking, meaning each note has a specific URL that can be used to hyperlink it from within another note, much like an online wiki. This way, when one note references another note – for example, a few lines of PHP that process a database query would require the MySQL connection data – the two can be linked for easily accessing one from the other. If you’ve already amassed a collection of notes with another app, Quiver supports importing notes taken in various file formats or apps, including Evernote. Additionally, users can export notes in common formats such as HTML, Markdown, or PDF, and all Quiver notes are stored in JSON, making cross-application compatibility for your notes much more likely. Users can also create shared notebooks in a cloud-synced folder on their computer, making collaboration with colleagues simple to accomplish. 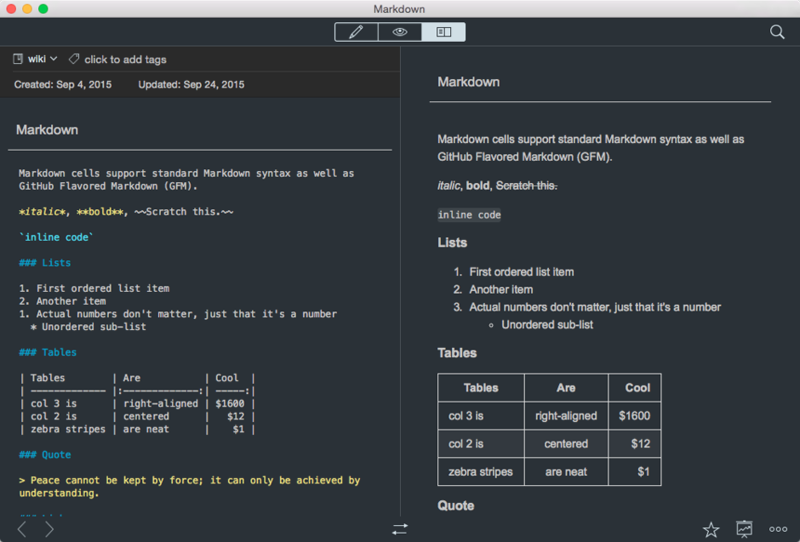 There are many additional features of Quiver I’ll leave for you to explore, from its split editing-and-live-preview screen for easier Markdown or LaTeX formatting to its beautiful light and dark themes (which are fully customizable with CSS) to its presentation view. 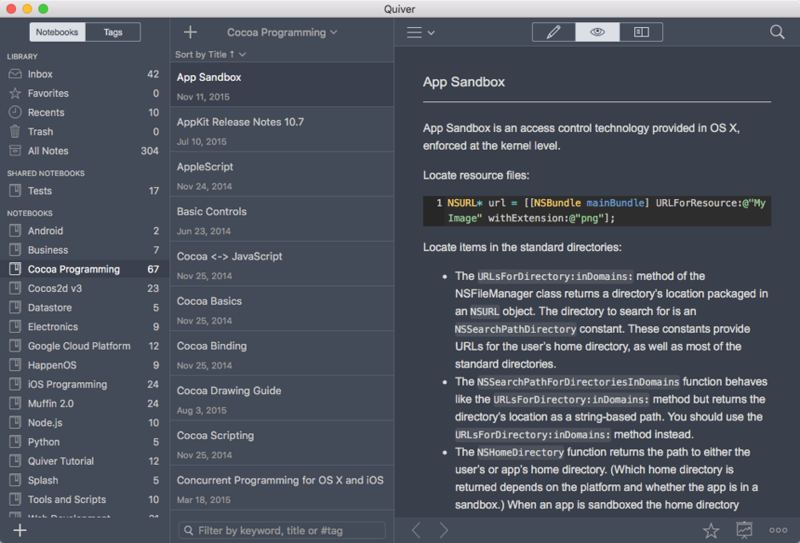 Quiver is built specifically for writing and referencing notes intermingled with code, and developers will find it to suit most if not all of their needs, but even beyond that, Quiver works very well for more common types of note taking, making it the ideal catch-all for anything you want to save for future reference. 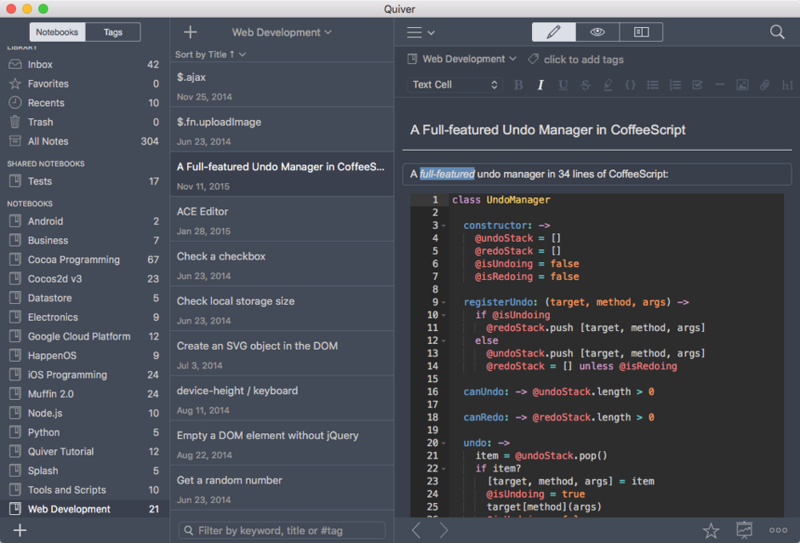 Quiver is self-described as “the programmer’s notebook”, a label which I can confirm is both accurate and understated. Soon after I downloaded Quiver, it became my personal wiki for storing any code snippet I wanted to keep for future referral. Any handy or reusable part of a program that I could possibly use in future projects can be dumped into Quiver with a complete explanation of its usage and links to any relevant or required code that may go along with it. 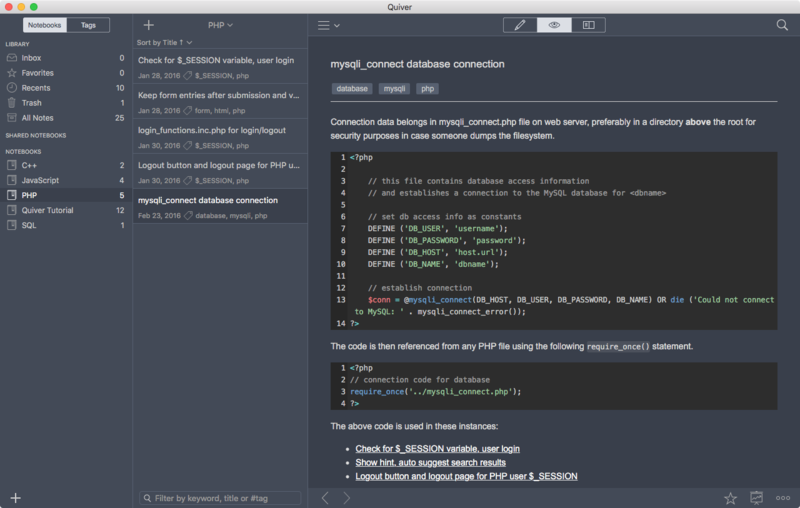 I would recommend Quiver to any programmer looking for a better way to store a function he or she might want to use in future project, to any developer who doesn’t want to scour Google yet again for that demo or tutorial code, and to anyone who may not even know how to write code but feels that Quiver’s feature set would work for them. Start taking and organizing notes now to have a “quiver” of code snippets and programming resources for years to come. 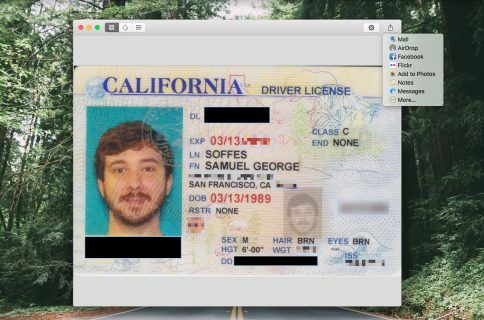 Quiver 3 is available as an OS X app for a worthy $9.99 price tag, and its developer tells me an iOS version of Quiver is already in the works.